5.1 How do you know? Cannabidiol, or CBD as it is more commonly known, is a derivative of hemp. CBD has recently exploded onto the US consumer market, following increased information about its potential health benefits. The supplement is seen as a dietary additive often used to reduce stress, anxiety, inflammation, and aches. The FDA also recently approved the very first CBD-based prescription drug to treat rare forms of child epilepsy. Even though the FDA has developed a singular drug for a singular purpose, hemp oil – another name for CBD – is widely available in a number of natural foods, supplement, and convenience stores. Even gas stations have started to carry hemp vape oils, tinctures, and candies. But, the widespread availability of an expanding range of products also means it is up to consumers to determine their viability and legitimacy. Not all products are created equal, and with something that will impact your body, it is paramount to ensure the vendor and their products are effective- and trustworthy- before buying. We have composed a guide of important information about CBD, its products, and its vendors to help make those decisions a little easier. There are a few details about CBD worth knowing right away. Cannabidiol can be derived from either cannabis or hemp. When derived from cannabis, CBD contains an additional, high THC concentration. This version is illegal at the federal level and in many states. CBD extracted from industrial hemp, however, contains 0.3% THC concentration or below. CBD from hemp is widely available across most US states, and is notably different from cannabis products. Due to the low THC levels in hemp CBD, the effects of inhaling or ingesting it are also different from using cannabis. Cannabidiol does not produce the ‘high’ associated with marijuana. Instead, cannabidiol binds to different receptors in your brain to reduce inflammation and relax anxieties. In fact, cannabidiol binds to the same receptors that THC attempts to, helping to counteract the effects of cannabis. Not only does CBD not produce a high, it can mute the psychoactive effects of THC. Low tetrahydrocannabinol levels in CBD have helped push the supplement through legal hurdles and put it in health, grocery, and convenience stores across the country. The 2014 Agricultural Act (better known as the ‘Farm Bill’) and the 2017 Appropriations Act (sec. 773) protect hemp-based cannabidiol from DEA classification on the Controlled Substances List. There is some controversy and speculation by the DEA about the legal implications of manufacture and sale of cannabidiol, but it has been largely refuted by the industry and by legislators responsible for the 2014 Farm Bill and the recently passed 2018 Farm Bill as well. The passage of legislation protecting hemp oil cultivation, manufacture, and sale comes at a pivotal time, when statistics for depression, anxiety, and general unhappiness are at pandemic levels. People often cannot afford expensive pharmaceutical treatments or therapies. They look to naturopathy, herbal medicine, or other alternatives to help quell symptoms and cope with disorders. CBD product companies are not officially allowed to list medical benefits to their use. Regardless, products’ explosive popularity and rampant availability has seen a number of studies to the result of cannabidiol’s legitimate ability to aid in physical and mental health. Some of the most recognized and studied effects of CBD include its anti-inflammatory, anxiolytic (anti-anxiety) and skin rejuvenation properties. One of the most prominent effects of CBD is its anti-inflammatory property. CB2 receptors manage pain and inflammation in the immune system. Cannabinoids bind to the receptors and alters how your brain responds to these symptoms. CBD has also been found to alleviate symptoms of muscle soreness, headaches, and stiffness from exercise. Hemp oil is also an useful anxiolytic. Our bodies naturally produce cannabinoids, just like the compounds found in cannabidiol. Studies show that anxiety patients who take CBD have lowered levels of stress and fear, especially with social anxieties like public speaking. The compound also has mood-boosting properties, and promotes healthy, natural sleep. CBD lowers stress and anxiety levels to allow for more restful, uninterrupted nights. A better sleep pattern ultimately helps curb anxiety or depression, increasing positivity of mind. Better sleep and more positivity increases clarity of mind. CBD also promotes alertness. It can keep people from feeling sluggish and tired throughout the day. That, too, helps with proper sleep patterns and better circadian rhythm. Topical CBD products are good for reducing irritation and redness in the skin. The anti-inflammatory nature of cannabidiol makes it a great aid for relieving the stress of damaged, itchy, or dry patches anywhere on the body (as long as it does not get in anywhere on the body). Before using any hemp oil product, be sure to check with a physician to determine if it is okay to use. While generally safe, there are a few minor contraindications and medications that can interact poorly with cannabidiol. Beta blockers, anti-epilepsy medications, and steroids are just a few. Vape oils are one of the most common CBD products on the market today. Oils – or juices, as they are sometimes known, are simple, effective, and get directly into the bloodstream. Inhalation bypasses the liver and allows for the supplement to act quickly and potently. Remember, though, oils only work with a delivery method – i.e., a vape. If you go the vape oil route, it is going to require an addition purchase of the electronics you will need to use the oil. You can find reviews of some of our favorite vape oils here. Tinctures are an ancient apothecary solution, and also act quickly by being absorbed under the tongue. A tincture usually comprises almost entirely of a concentrated version of a singular ingredient. Ancillary ingredients can include a carrier oil and flavoring to mute the taste if the active ingredient is strong (and perhaps not a friendly taste). Natural tinctures with a grapeseed carrier oil are fairly common, so be sure to make sure the ingredients are simple and natural before purchasing. Droppers are not the only way to get CBD concentrate under the tongue. Sprays are available for similar effect, but with the simple twist of being able to pump a couple spritzes under the tongue, instead of counting individual drops. We reviewed Every Day Optimal CBD products, including their tincture (and a gum) here. Hemp Bombs CBD vape oil. Foods, mostly snacks like cookies or chocolate, are a quick and easy way to ingest a CBD supplement. Almost like gummy vitamins, popular cannabidiol treats come in the form of gummies. Lollipops and other hard candies are also starting to make their way onto the market more readily. Choose what works best for your diet or on-the-go needs. Another ingestible, the capsule, is also simple and familiar. Capsules, also, are like many other supplements in health food or natural goods stores. They are comprised of concentrated, powdered CBD and work a little more slowly than their inhaled counterparts. Be careful with edible products not to overeat. Portion them out based on a recommended dosage, or after trial and error to determine what works for your specific needs. Just like other vitamins and supplements, hemp oil should not be overused. We reviewed some of our favorite CBD edible products here. Topical cannabidiol products usually take the form of skincare products, like lotions or balms. Topical products are straightforward and have no special application requirements. Part of their rise in popularity comes from how familiar and simple they are to use. Keep in mind, however, that their drawback comes from their limited scope of us. Topical products only affect the applied area, generally speaking. This makes CBD lotions good for inflamed or irritated areas- like eczema or rashes- or sore and achy muscles. Topical CBD is not recommended for anxiety or other internal concerns. Face Creams, like other topical products, are limited and scope and function. However, CBD does have a propensity to rejuvenate and reinvigorate the skin. Thus, special attention has been made to manufacture facial cream and mask products. We listed some of our favorite CBD creams and topical applications here. Humans are not the only ones to benefit from using CBD products. Pets, like cats and dogs (and other mammals, too, in case you have ferrets or rabbits at home) have been studied under the effects of hemp oil. The same soothing, anti-inflammatory properties that work on humans will work on animals, as well. So, if your furry friend has separation anxiety, or perhaps suffers from joint pains, consider picking up some hemp oil to add to their food, or shop for some specially-made CBD treats. Be mindful, though, as CBD has been known to cause drowsiness in cats and dogs. Our review of Nature’s Script & Hemp Bombs CBD Oil for Pets can be found here. 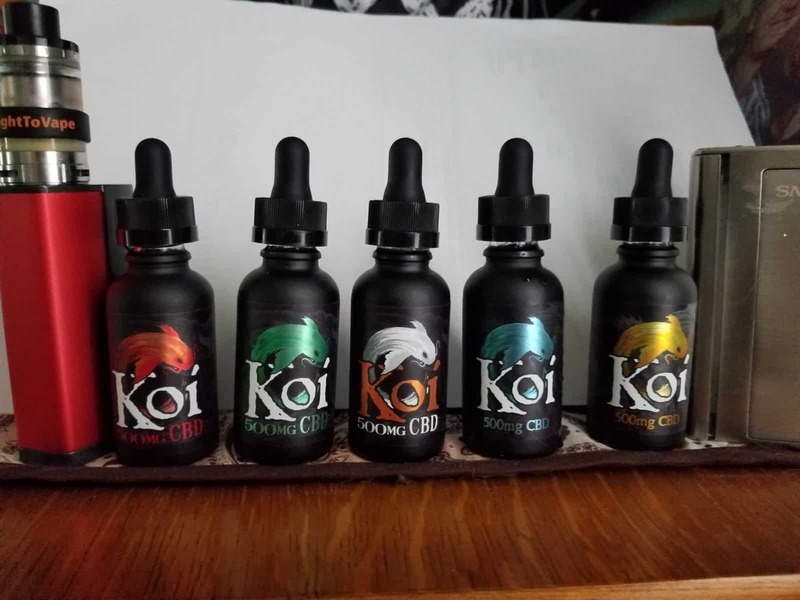 Koi CBD makes a line of incredible dog treats. The actual content of cannabidiol in a CBD product is the most important aspect of a purchase decision. It would be a shame to waste money on something ineffective. Double check the value of milligrams of CBD found in a product before purchase. The overall volume listed on packaging refers to the full product – and all its ingredients. Products listing higher CBD milligram volumes are more potent and stronger in effect. They are also often more expensive, so there are a number of other factors to consider, depending on your needs and your budget. The taste, or perhaps lack thereof, is one of the most important considerations for a CBD purchase. Tinctures and oils go into or past the tongue, and will often carry a flavor. If mixed with another flavor, like a sweet or a fruit, the taste of hemp is usually pretty well masked. If not, be ready for a strong, earthy flavor, which some find displeasing. Capsules are a good alternative to juices. Quickly swallowing a capsule bypasses the tongue almost completely, and they are flavorless. Of course, one major consideration for any consumer decision is the price. Do the due diligence of checking around local vape shops and online retailers to find a good strength to cost ratio for the product. The type of product, purported effectiveness, and packaged quantity will all factor heavily into CBD pricing. How quickly does the product need to work? Some bypass the liver, like tinctures and vape oils, for near immediate effect. Products like capsules have to be digested and distributed throughout the body, making them more ‘extended-release’ in nature. For maximum effectiveness, it is also important to remember to use hemp oil daily, like any vitamin or supplement. Similarly, the quicker that CBD gets into the bloodstream, the faster it wears off, usually. Sublingual products (placed under the tongue) like tinctures and oils, or inhaling CBD in a vape get to the bloodstream faster, but can wear off within a few hours. Capsules or topical applications take between 20 to 60 minutes to work, but their effects can last anywhere from 4 to 6 hours, usually. CBD has gained more mainstream attention in even just the past year. Finding it in grocery and convenience stores means all sorts of different customer backgrounds and levels of knowledge or experience. Select a comfortable product. If unfamiliar with vapes or e-cigarette devices, juice would be an obvious mistake without making a more sizable investment in a mod, tank, etc. For newer users, or someone looking for a simple, straightforward approach, the best bet is a tincture or a capsule. Droppers (or sprays) and capsules offer simple, effective dosage control. On the other hand, some folks relish the opportunity for fine-tuned control. Mixing and micro-dosing are just a couple of the more technical aspects of using a mod and juice set up. Still more advanced than a tincture, but pen vapes with CBD cartridges are a good way to bridge the gap between simple and advanced intake methods. Pen vapes found readily at places like local gas stations are cheaper and easier to use than complex mod/tank setups. CBD product manufacture and sale is still a relatively new field. It is especially important, then, to conduct effective research into their ingredients and practices before deciding to buy. Be sure the products list industrial hemp as the source for their cannabidiol. Industrial hemp products will contain the required 0.3% or less THC content. If the THC content of a product is higher, it is likely derived from cannabis – and is also federally illegal. If a company is unable to produce a Certificate of Analysis by a third-party lab, it is a potentially unsafe product. Third-party labs conduct testing on CBD products to ensure they are free from heavy metals, mold, and other contaminants. GMP stands for Good Manufacturing Practices. The company’s product labels and website should contain a GMP stamp somewhere on the packaging. The FDA and Health Officials control GMP quality inspections, and are responsible for issuing a GMP approval. Be wary of companies that list specific ‘health claims’ for their products. CBD has undergone significant study to its credit in helping alleviate some bodily concerns. However, any product stating it will ‘cure’ or ‘resolve’ a specific illness or disease is a red flag. People are often also a good judge of a company’s legitimacy. Read product reviews, especially in-depth ones. Do not only look at a ‘star rating’ for a product, as false submissions can easily manipulate those scores or ratings. Instead, take the time to read over serious product reviews, or even check some third-party review sites for honest and thorough reporting, like ours. Once you have found a product and believe it will work, make the commitment and make a purchase. Until you actually have the product in hand (and in your body) you will always be working off of abstract information. Be careful to have done the due diligence we mentioned here. Once you have, pick something up and see how it goes. Trying out a product will take some time. Do not expect to drop CBD under the tongue or inhale a few puffs on a vape and ‘feel’ it. Yes, as your body experiences something new, you will likely notice it on the first or second use. However, keep at it. Only after a week or few will the serious, long term effects be noticeable. Use that time table as the gauge for how to adjust what you need. And, keep researching. Finding a product that works for the moment is great. The industry is always in flux and advancing, however, given its newness. Keep a finger on the CBD pulse and check for more product types, better companies, and (of course) the industry’s changed legislation and practices. Next articleFDA Made Surprise Visit to Juul HQ – What Did They Want?